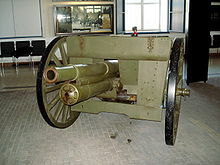 The 76.2 mm divisional gun model 1902 (Russian: 76-мм дивизионная пушка образца 1902 года) was a Russian light field gun used in the Russo-Japanese War, World War I, Russian Civil War and a number of interwar armed conflicts with participants from the former Russian Empire (Soviet Union, Poland, Finland, Estonia, etc.). Modernized versions of this gun were employed at the early stage of World War II. This gun, known as the "three-incher", (трёхдюймовка) was developed by Putilovski Works in Saint-Petersburg in 1902. The lead designers were L. A. Bishlyak, K. M. Sokolovskiy and K. I. Lipnitskiy. It incorporated many new features for that time - carriage with recoil devices, traverse and elevation tracking mechanisms, precision sight for direct and indirect firing, manual interrupted screw breech and single-piece ammunition loading. For simplifying the mass production process designers used in the gun's construction cheap types of carbonized steel without or with minimal use of rare and expensive nickel-, manganese- or chromium-added types of steel. Early version had two seats for the crew on both sides of a barrel, from 1906 they were replaced with an armoured shield. The shield had a specific design: an outer shield, with a big rectangular opening, and a smaller, inner shield behind it. The upper and lower portion of the bigger shield were folding during transport. The gun had fragmentation shrapnel and canister ammunition. More specialized types of projectiles included smoke, incendiary, and chemical rounds. Many ammunition pieces were French originated. Limbers could carry 40 or 44 rounds in a light artillery and 28 rounds in a mounted artillery, while caissons carried 48 rounds in both cases. M1902 divisional guns were the mainstay of Russian Empire artillery and were accepted well by the army. Their characteristics were at the same level with similar 75-mm French and German guns. The gun was used in action for the first time in the Russo-Japanese War at the Battle of Telissu, but proved ineffective due to lack of crew training and the outdated conceptions of the senior artillery officers. The M1902 was also used during World War I. After the collapse of the Russian Empire in 1917 M1902 guns were employed by different factions: bolshevist Red Army, monarchist or counter-revolution White Guard, nationalist forces in Russian-minority areas, national armies of Poland and Finland and simply anarchists and bandits throughout the vast territories of former imperial Russia. In some episodes the gun saw its first anti-tank usage. The White Guard and intervening Allied forces used a small number of tanks, primarily French Renault FTs and British Mk Vs or Whippets. The M1902 gun with its high muzzle velocity was an effective weapon against such targets with only anti-bullet armour protection. In the 1920 Polish-Soviet War M1902 guns were again used against Polish FTs. Due to a string of Russian defeats during the first two years of World War I large numbers of M1902's and their ammunition ended up in German hands. A combination of factors led the Germans to issue M1902's to their troops as replacements. An underestimation of light field artillery losses during the first two years of the war and an inadequate number of replacement guns being produced. An underestimation of ammunition consumption, inadequate production and resulting shortages. The superior ballistic performance of the M1902 compared to German designs. Once production of German guns and ammunition caught up during the last two years of the war the M1902's were converted to anti-aircraft guns on a number of different high-angle mounts and these continued in German service until the end of the war with German ammunition. Poland captured large numbers of M1902 guns in a course of the Polish-Soviet War and impressed them into service as a standard piece of the mounted artillery, designated 76,2 mm armata wz.1902. In 1923, there were 568 guns wz.1902 in inventory. Most were converted to wz.02/26 guns in 1926-1930 (see below), however, Poland also retained some of the guns in the original 76 mm caliber to use existing stocks of ammunition. There were 89 of original guns available at the outbreak of World War II, among others, the sole gun used during the Battle of Westerplatte on 1 September 1939. Poland and Soviet Union modernized their M1902 guns after the end of World War I. Polish designers made their minor enhancements in 1926, resulting in the Armata 75 mm wz.02/26 gun, which was rechambered for firing 75 mm shells used by the most numerous Polish field gun, the Canon de 75 modèle 1897. The USSR continued mass production of M1902 gun until 1931 when it was replaced by its enhanced M1902/30 variant. For Soviet modernization see 76 mm divisional gun M1902/30. Both variants were utilized in the early stages of World War II. There were still 2066 guns of M1902 model available in 1941. The Soviet stockpiles of 76 mm ammunition for this gun were so large that the Soviet army decided to retain the 76 mm caliber ammunition for their modern field guns designed in the 1930s (F-22, USV and ZiS-3), even as other armies changed to larger calibers for their basic field gun. Wikimedia Commons has media related to 76.2 mm divisional gun M1902. ^ a b Chamberlain, Peter (1975). Light and medium field artillery. Gander, Terry. New York: Arco. p. 57. ISBN 0668038209. OCLC 2067331. ^ "77-77 MM CALIBRE CARTRIDGES". www.quarryhs.co.uk. Retrieved 5 September 2017. ^ Kowner, Rotem. Historical Dictionary of the Russo-Japanese War, The Scarecrow Press, Inc., 2006, p. 372. ^ Fleischer, Wolfgang. German artillery : 1914-1918. Barnsley. pp. 89–90. ISBN 9781473823983. OCLC 893163385. This page was last edited on 10 October 2018, at 01:10 (UTC).